With an extra week’s vacation, I figured, why the hell not? I’m very excited to see the PAPA facility (with 400 games) and compete along side the best of the best. It’s also such a treat to just PLAY in a tournament and not have a hand in putting it on. Several other Bay Area Pinball players will be making the journey east, including current PAPA World Champion Andrei Massenkoff. We’ll do our best to bring back some trophies to the Bay. 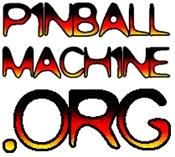 ← Ring in the New Year at the Pacific Pinball Museum!